This one turned out awesome. I can honestly say that I am thoroughly exhausted, as this quilt top was pretty much constructed between yesterday and today. 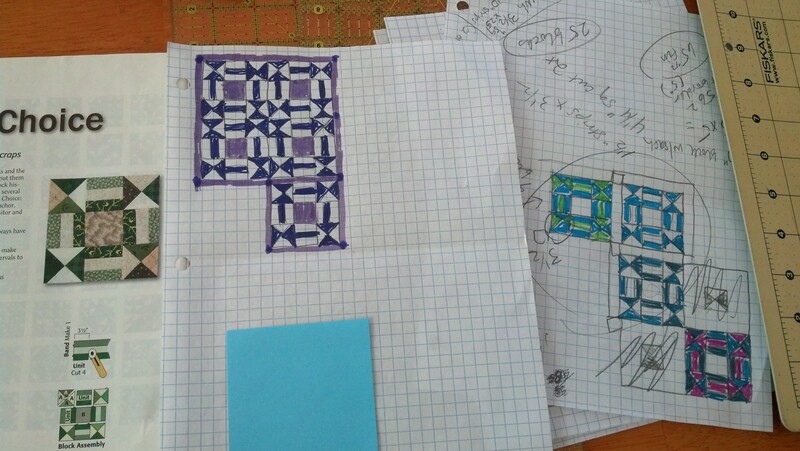 You can see I drew the blocks together, and then put sashing with darker cornerstones around the outside. 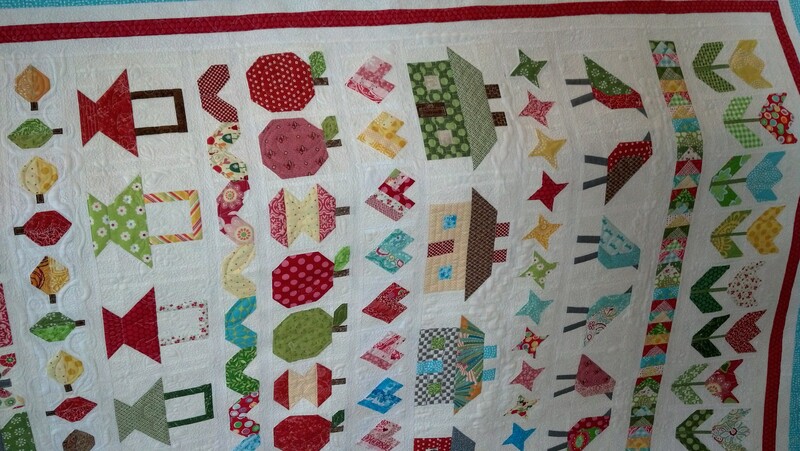 I originally planned on putting the blocks together, but thought again that without sashing, it would be too muddled. 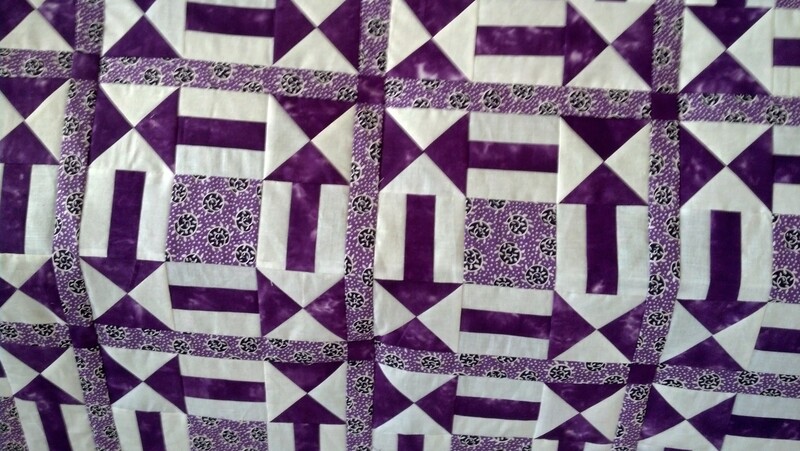 When I added the sashing and matched the centers to it color-wise, I really liked the look. 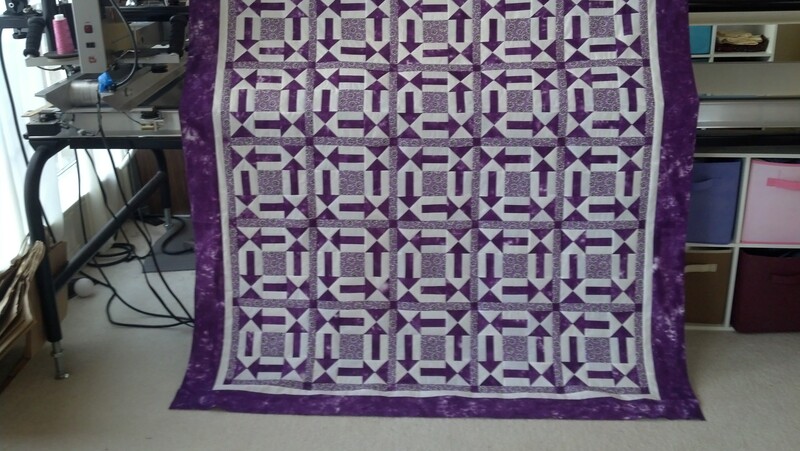 It took me (literally) 2 full weeks to quilt. If you get out to the show, look for it! 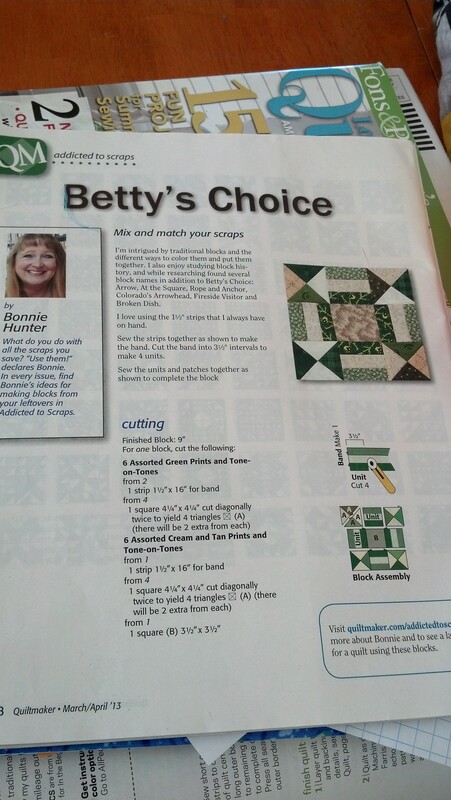 It’s hanging at Quilt Country if you’d like to see it in person. 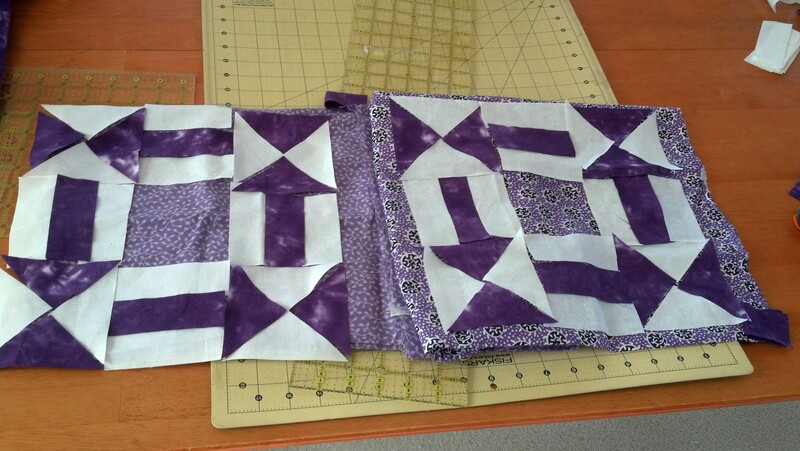 I picked up the fabrics Sunday and brought it back, pieced, quilted and bound Thursday morning. I’ve been quite prolific this month. 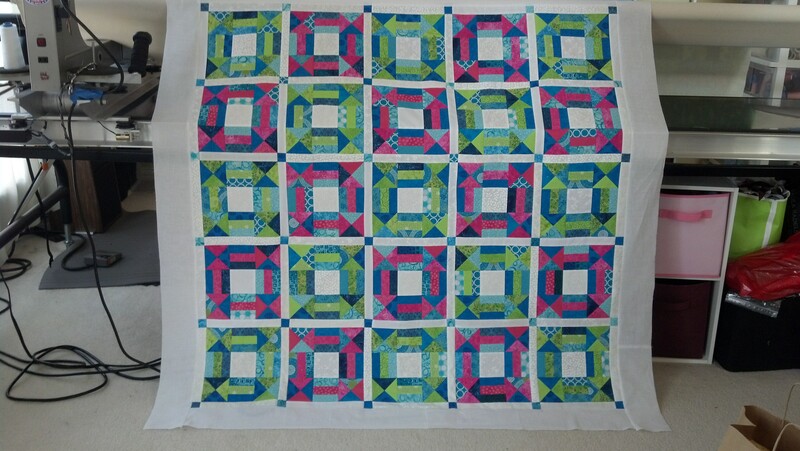 So I cut my strips and squares and after deciding to use only plain white for the blocks, cut that too. I found this light purple (left) I thought would be great for the centers and sashing, but it seemed sort of bland. So I took what I thought might end up as the border (right) and put that behind some pieces to see how that would look instead. The blocks came alive!! So I cut what I needed from that and somehow got everything assembled today! I used the white as a small inner border and the dyed purple as an outer border and I LOVE how this turned out! I also ensured the placement was correct on the blocks, so the arrows REALLY come through! 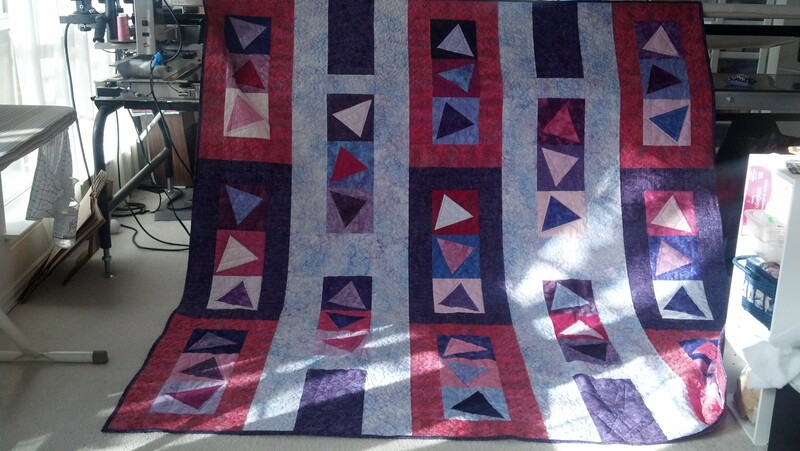 It has a much cleaner look than last months quilt top, perhaps that had too many colors mixed in. At any rate, I am really happy with this result! I will definitely get to work on the next month’s version of this block sooner than I did this month! I will post soon about garden progress and other things. In the meantime, happy quilting my friends!